Cutting back on portion sizes is the easiest way to trim excess calories, fat and sugar from your diet, but it can also be quite challenging. Restaurant and fast-food portions are far larger than those appropriate for a healthful diet. Learn to identify healthy portion sizes, then create new eating habits by using techniques that help you feel full while eating less. Getting used to eating smaller portion sizes is a matter of practice and knowledgeable attention to what is on your plate. Set a deck of cards, tennis ball and four dice on your table or kitchen counter. 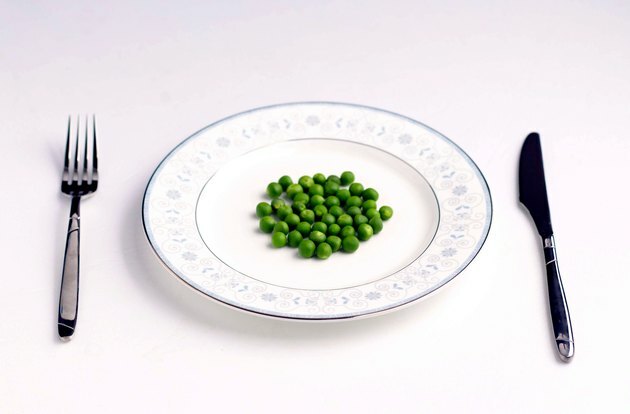 Compare the portion of food on your plate to the size of these items at each meal. Any serving of meat should be no bigger than the deck of cards; no serving of cheese should be larger than the four dice; and pasta and vegetable portions should be about 1 cup, or the size of the tennis ball, according to Columbia University Health Services. Use a smaller luncheon plate instead of a dinner plate for all of your meals. Fill the plate once and do not return for seconds. Place crackers, chips, popcorn or cereal for snacking in a small cereal bowl rather than eating out of the bag. Do not refill the bowl after you have eaten its contents. Ask for a doggie bag with your meal order at restaurants, and immediately put half of your restaurant meal into the bag before eating. Eat the meal remaining on your plate, and take the bag home and put it in the refrigerator for lunch or dinner the next day. Increase the number of servings of fresh fruits and vegetables in each meal. One serving of vegetables is about 1 cup, the size of the tennis ball, according to the American Cancer Society. The high fiber content of fresh fruits and vegetables will help create a feeling of satiety without conveying many calories. Eat slowly. It takes 20 minutes for the brain to signal satiety, according to the University of Nebraska Cooperative Extension in Lancaster County. Sit down to a meal and eat slowly, giving the brain time to signal the body that it is full. Choose high-fiber, whole-grain breads and cereals to increase a sense of fullness and improve nutrition and digestion. Drink plenty of water, and eat broth or tomato-based soups, rather than cream-based ones, to create an increased sense of fullness with the addition of few calories. Eat a small dessert at the end of a meal when you are already full to give you a satisfying flavor sensation with less risk of eating a large portion. Consult your physician before making drastic changes to your diet to ensure that it will not interfere with medications and that all of your nutritional needs are addressed. Columbia University Health Services; Controlling Portion Sizes; Katherine Brooking, M.S., R.D. What Is Considered One Serving Size? How Many Calories Should Be Consumed at Dinner?